Pair of moccasins (Native American, Nez Perce, 1890-1900). Leather and beads. Gallery Instructor 50th Anniversary Fund to support The Heritage Fund for a Diverse Collection (2016.166.1-2). Photograph © Museum of Fine Arts, Boston. 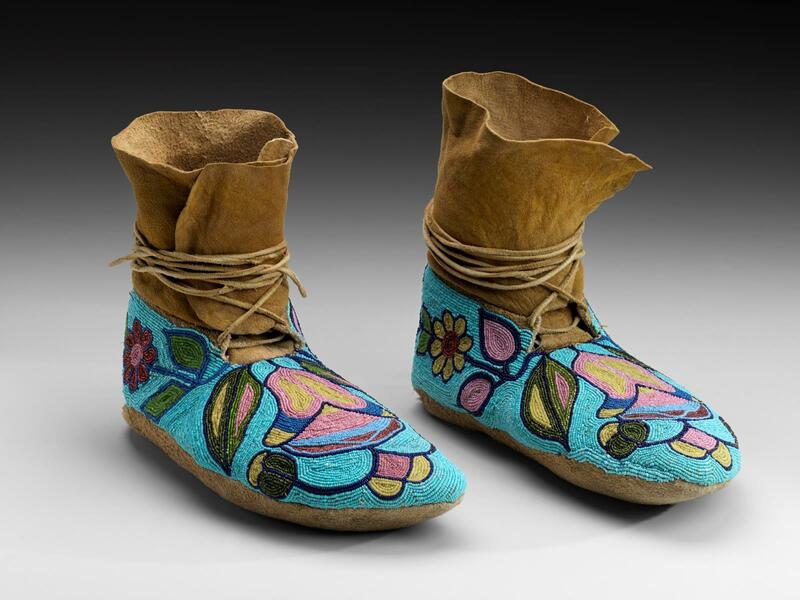 These exquisitely beaded moccasins were the first of Nez Perce culture (Columbia River Plateau) to enter the MFA’s Textile and Fashion Arts collection. They arrived in 2016 during the early weeks of my joining the department—exceptionally beautiful and flawlessly executed. My eyes followed, with the wonder of a child, the hand of the maker patiently working her stitches over the buckskin surface, tracing the fluid contours of a life-affirming floral design and taking delight in bright, vivid colors rendered in tiny faceted glass beads that sparkled with light. 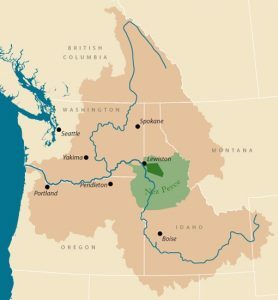 This map of Nez Perce tribal land shows the reservation in dark green and the land ceded to the United States in light green. Surrounding tan area is the Columbia Basin. Click image for website source. Floral beadwork of the Nez Perce (Nimi’ipuu) and other Plateau tribes, a style that came to supplant preceding geometric styles, arose during the mid-nineteenth century arrival of Protestant missionaries and their encouragement of assimilation, tribal land cessations, and the forced habitation of Native Americans on reservations with a greatly reduced land base. Efforts by both the US government and the Church to destroy Native culture and religion, including the outright banning of tribal ceremonies and Native medicine practices in the late nineteenth century, intensified an underground resistance amongst the Plateau tribes. Native American expression through floral motifs worked in glass beads was a way to preserve cultural traditions and values on a variety of levels. 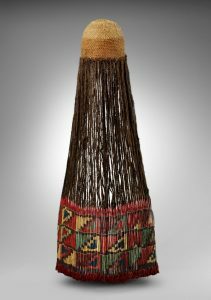 Access to trade materials and exposure to American-made floral printed cloth and wallpapers, together with a close identification with plant life as integral to Native American beliefs, resulted in the emergence of a distinctive beadwork tradition that allowed Native Americans to produce artistically beaded objects for trade while simultaneously communicating distinct tribal floral styles in the highly-prized decorated clothing they embellished for themselves.